On March 20, the University of Louisiana at Lafayette's Jazz Studies department will present “Big Band Showcase” as a special event to raise funds for the Jazz Ensemble's upcoming concert tour of central Belgium, which will take place during the university's Easter break from April 14 - 22. In the 2004, the Jazz Ensemble received an invitation to tour Belgium and perform a number of concerts after several conservatory musicians flew to Lafayette to meet Dr. Bob Luckey, the ensemble's director, and to hear the jazz group live. |According to Luckey, a Belgium conservatory heard about the ensemble at UL Lafayette, and they were impressed and interested in their music. 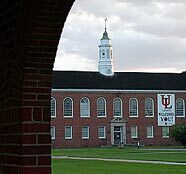 During the course of a year, they sent more than six representatives to UL Lafayette to hear the ensemble play. Plans were made that the conservatory members would travel to UL Lafayette to perform during jazz week of fall 2005, and participate in some master classes. Due to budget constraints, their trip was canceled. Luckey thought that the other half of the deal, where the UL Lafayette Jazz ensemble would travel to Belgium would also be canceled, but instead found out otherwise. This is the first time that the Jazz Ensemble has been invited to perform in Europe, and as part of the trip, they will be showcased around Brussels and Namur. So far, Luckey said about four concerts will be arranged as well as some sight seeing excursions during their week-long stay. Featured at the “Big Band Showcase” will be five area high school jazz bands and the UL Lafayette Jazz Ensemble. Participating schools include: the Abbeville High School Jazz Band, director Herb Dennis; the Acadiana High School Jazz Band, director Jared Grey; the Lafayette High School Jazz Band, director Rudy Espinosa; the North Vermilion High School Jazz Band, director Jude Gaspard and the St. Thomas More Jazz Band, directors Ronnie Gleason and Bill Raxdale. “ Big Band Showcase” will take place in Angelle Auditorium beginning at 7:30 p.m. Ticket costs will be $10 general admission and $5 for senior citizens and those with a UL ID. Children under the age of 6 will be admitted free of charge. For more information call 482-6012.